Industrial processes often have many stages aside from the simple production of a base material. Instead, industrial processes frequently involve the application of some sort of paint or finisher. To this end, there are many different application brushes that will fit a myriad of needs. Application Brushes Industrial processes often have many stages aside from the simple production of a base material. Instead, industrial processes frequently involve the application of some sort of paint or finisher. To this end, there are many different application brushes that will fit a myriad of needs. Within metals and metal products, application brushes may be designed for aluminum processing (painting lines), brass and bronze processing, steel processing and finishing (galvanizing lines, coating lines, painting lines, annealing lines and pickling lines) weld prep and cleaning or wire stripping. 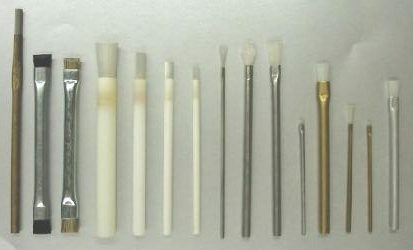 Application Brushes - West Coast Brush Mfg., Inc. In the world of wood processing, application brushes are used for wood decking, composite decking, softwood and hardwood decking and applying finish to furniture, hardwood, softwood and surfaces in general. For food processing applications, these brushes may be used to polish, wax or wash fruits and vegetables. Application brushes in electronics often aid in fluxing. Application brushes come with many customizable features, such as their filament material. Filament options include nylon, abrasive nylon, polypropylene, polyester, horsehair, wire and natural fibers like tampico. The best option for an application job that involves harsh chemicals is polypropylene, because it is resistant to many acids and solvents. Additionally, it is designed to withstand high moisture settings, and its bristle will remain stiff even if saturated. Another material that may be good for such a job is polyester, because it offers resistance to abrasion and consistent stiffness even when saturated with liquid. Natural fibers are a good choice for wet cleaning, especially on easily damaged surfaces, as they are less abrasive than synthetic materials. Horsehair is excellent for waxing and polishing because of its stiff and highly absorbent bristles. Wire is a good choice for an application that requires cutting action. Other variables of application brushes include filament trim length, diameter, depth, handle length, density and pitch. The denser the brush, the more liquid it will apply per stroke. 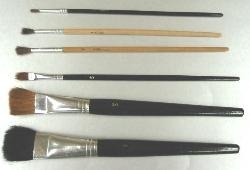 A brush may be styled with a rewrapped shaft, strips or coils, or it may be disposable.